In honor of apple picking time, I made these cookies for my church Activity Days girls and for my daughter's new teacher and of course I made some to share with my Food Critics (my family). I just took a bite of a frozen one --- yum! I love homemade frozen sugar cookies. 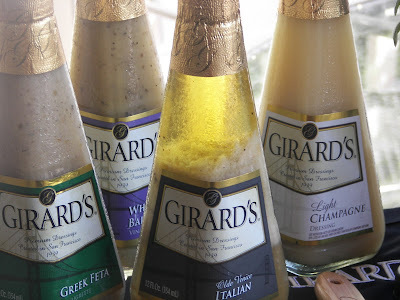 This is the last night for my Girard salad dressing giveaway -- a 4 pack of these premium dressings. I had some Old Venice Italian for lunch -- it is one of my favorites. Click HERE for the giveaway. Click HERE for the sugar cookie recipe, Royal Icing recipe, and marbling technique. I still have a lot to learn about Royal icing, but I really enjoy the creative part of decorating cookies -- it is relaxing to me. I think your cookies are just yummy looking! I usually put the icing in a bag and pipe the outline. Put some zigzaggy lines in the center and smooth with a small icing knife. My outline is not usually the best in the world though! The apple picking cookies are toooo cuuuute!!! I'm in love with sugar cookies and those are some of the yummiest I've seen in a while. I love the green apple color mixed with the red! sooooo pretty. I would love a plateful of these from off your "apple tree". I just had one of your apples. It was cold and wonderful. Great variety. Bright, perfect, and cheerful for the occasion! You make the cutest cookies..one day i looked back at many of your posts and loved all the kid themed things..
You're so good at that swirling! Beautiful cookies! I envy your talent...and your patience. P.S. Love the way you did the little stems too! They are so cute! What a sweetie you are giving these as a gift to the teacher. I wish your kids were in my classes when I was teaching! 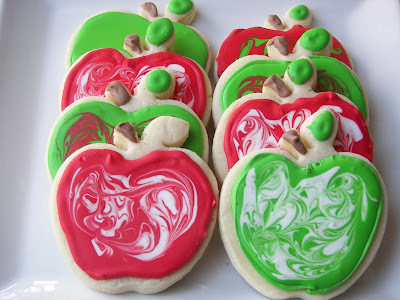 Love the apple cookies - they are so cute and perfect for the season! Found your link up on Sweets for a Saturday. My very favorite thing about this blog, besides the frequent use of the color red, is that you keep a littl theme going. I love things like that. Your cookies look wonderful! Love the swirl on them!!! Your cookies are beautiful! They're really putting me in the mood for fall baking. I'd like to invite you to share your recipe on Sweet Indulgences Sunday. Those cookies look amazing!! I so would have eaten more than one bite. Off to check out the recipe! These are adorable, as always. I've never tried a frozen homemade sugar cookie, but I believe you when you say it's good...I will have to try to remember this. Gosh, I'm now thinking about eating frozen cookies and getting really hungry. I bet they are still kinda chewy and not really frozen hard? Whoever mentioned above that you could go into business is right...there are a lot of sellers on Etsy that sell baked goods, etc. The things you make always sound good, but look good too. One of my favorite cookies ever came from an Etsy seller. Beautiful, and they look tasty. I linked to you from Sweets for a Saturday. Love your blog! Joni, I feel the same way as you do about cookies:) I love your apples...the epitome of fall! SO pretty! Everytime I look at your blog, I am starving for a cookie! What pretty Fall cookies!! You did a great job in decorating them. I'm visiting from Foodie Friday. Oh My Gosh! These are so cute! I would LOVE it if you came over to Cast Party Wednesday and shared your cookies with us. We would love if you would come by our blog and share this recipe and any other apple recipes with our readers for Sharing Sundays. This looks so great - love it! !